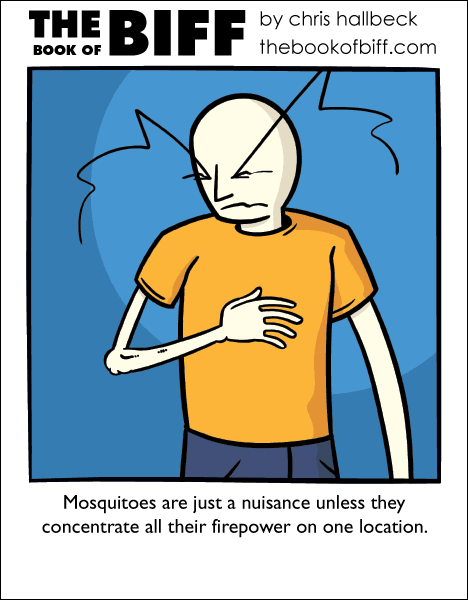 Mosquitos mostly leave me alone when I’m out walking around or doing yard work. The problem is when I take the dog out. As soon as she picks her spot and I need to stop moving I’m bombarded. It must look hilarious to my neighbors as I apparently wiggle and wave for no apparent reason. Also, FINAL WEEK! I’m having a moving sale! Use the code MOVING at checkout to get 25% off your total order. Make my life easier by having less stuff to haul away in a truck! Go to the store here! Weird timing for this comic, my fiance has spent all weekend being eaten alive by those flying vampire bugs! I have only been bitten by mosquitos (or whatever else it could have been) twice. I never noticed when it happened, but both times I got a red, swollen area on my arm, about an inch or so in diameter. Ahhh… last summer. All the fun camps and games, all the paintball that came with so many mosquito bites… wait. Last year while I was playing paint ball. One of the places was a forest. And the rules changed for the forest. You were aloud to hit someone with a paintball at point blank range. Some had auto guns too. So it was either get eaten by a million mosquitos or get hit with twenty paint balls. My decision? Get eaten alive. After that I got about thirty mosquito bites all in around the same spot. It was all along my shoulders across my chest and back. It was like a big strip of red bumps that itched like crazy. We had to get a family portrait a couple days later. At least the skeeters didn’t go for his head.